Eddie Taylor was one of a generation of great club men, one-club men, that spanned the war years. He was the first to enunciate for me what many others of that generation lived by and that was the belief that “You do what your club needs you to do.” In Shettleston there were David Morrison, Wilie Laing and the Scally family for a start, in my own club of Clydesdale Harriers there were David Bowman, George White, James P Shields. Bill Elder at Glenpark was another. Starting as an endurance runner, Eddie had some good runs for the club in the 1930’s. In season 1935/36 he ran for the club in the Midland District Championships where the team finished fifth. The following winter he ran in the National Novice Championship where he was a non counter in the wining Shettleston team. He was also in the four man B team in the Midland Relays that finished a creditable seventh. 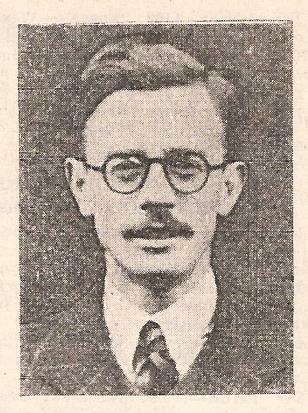 In 1937/38 he was a member of the winning team in the McAndrew Relay at Scotstoun along with Jim Flockhart, Willie Sutherland and Willie Donaldson. In 1938/39 he ran in his only Edinburgh to Glasgow relay on the fifth stage where he pulled the team up from ninth to seventh before handing over to Jim Flockhart who picked up one more on the star studded sixth stage of seven miles. He also ran in the National that season. Eddie was running well in the years immediately before the War and won several club championships: in 1936/37 he won the club novice championship and also won the Shaw Cup which was held over eight handicap events varying in distance from 75 yards to two miles. When the War intervened, the club members who were not, for several different reasons, in the Forces, kept the club going and Eddie was one of those men. He had been secretary in the 1938/39 season, and then acted as treasurer from 1940/41 to 1942/43 before taking the President’s chair in 1944/45 and 1945/46. There were further stints as club president in 1953/54, 1965/66 and 1966/67. As a coach he coached high jumps, long jump, triple jump and javelin to Senior Coach level as well as sprints, middle distance, shot and discus at club coach level. This is an incredible list – nowadays they would be level four for the first four and level three for the second four! Little wonder he was one of the first to be recognised as a Master Coach when the award was first instituted. He was also Scottish coach for various disciplines as well as for what was at that time called multi-events. He was very far sighted as a coach: in a letter to the ‘Athletics Weekly’ a number of years ago, one coach was complaining about his sessions being stolen by other coaches. Eddie was the very reverse of that. Two examples. First from the official Shettleston Harriers history quoting the minutes of a club meeting. “Going into the track and field season the club had amassed a greater number of coaches than ever before ‘for all events’ and was now offering specialist coaching on an individual basis and not only to club members. Coaching convener Eddie Taylor urged the Committee to encourage others outside the club “to place themselves in the hands of the many coaches”, an approach that was to become a feature of the club’s policy during the 60’s” Eddie was never narrow of outlook. Second, when we at Clydesdale Harriers were holding throws coaching sessions for local schools, we invited several coaches from outside the club to help. Eddie was the national coach for javelin at the time and he came along willingly nd when another coach from another local club refused saying that “Clydesdale only wanted to recruit for themselves,” he rebuked him saying it was good for the sport. The Shettleston AGM in 1964 was magnanimous in its praise of the coaching of young athletes done by Eddie and by Alex Naylor – another who coached “the body of the Kirk”. Both believed in the “all who will may enter” school of coaches. He was a very good and popular National Coach for the Multi-events, now known as Combined Events. We were both on the West District of the SAAA Coaching Committee in 1979 and 1980 and he passed on a lot of very useful information informally at these events. Even though by then he was known as a very good coach indeed, he never failed to take any opportunity to add to his store of knowledge and was a regular attender at coaching courses wherever they were being held. As an administrator he served on club, county, district and national committees rising to senior positions in them all. The highest position in Scottish athletics, President of the SAAA, was held by Eddie in 1974, after he had worked his way through all the committees and subcommittees over the years. He was also accorded the honour of life membership of the SAAA. Having been admin officer, coach and team manager for Scottish international teams and representative squads literally for decades, Eddie was certainly effective. For example when I was admin officer for the men’s team in the Bell’s Junior International in 1980, Eddie was team manager and he gave the appearance of being ‘easy-going’ but he was very sharp indeed. He knew all of the athletes in the team and knew how they all had to be dealt with and which ones to watch late at night as well! As far as awards were concerned, he was rightly recognised by the authorities. In 1990 he won the Betty Claperton Trophy which is awarded annually to the person considered by the Coaching Committee to have given outstanding service to coaching and in the same year was awarded the Tom Stillie Memorial Trophy which is awarded annually to the person considered by Council to have contributed most to Scottish Athletics. To be awarded either is an honour but to be awarded both in the same year is unique. Athlete, coach, committee man nationally and locally, and administrator, Eddie was also a reporter for the ‘Scots Athlete’ magazine which was the Bible of the sport in the 1940’s and 1950’s. Eddie was never unprepared – he was always up-to-date with his knowledge of coaching of Scottish athletics generally. He was genuinely ‘easy-going’ as Lachie said, but behind that was a thorough going professional attitude to everything that he did.